In 2004 Michael Singer Studio began working with the Friends of the W.E.B. Du Bois Homesite on identifying the opportunities for using the Homesite and the surrounding area as sites for honoring W.E.B. Du Bois, a pioneering African American scholar and activist born in Great Barrington in 1868. Singer Studio worked closely with stakeholders from the Great Barrington community, the Du Bois Center at the University of Massachusetts, the AME Zion Church, The Great Barrington Land Conservancy, and the Great Barrington Historical Society conducting interviews and research to determine opportunities and constraints at the Homesite and in Great Barrington. In 2006 Michael Singer Studio produced a short report and presentation Commemorating W.E.B. Du Bois, which outlined several options for the Homesite and downtown Great Barrington. Michael Singer presented Commemorating W.E.B. 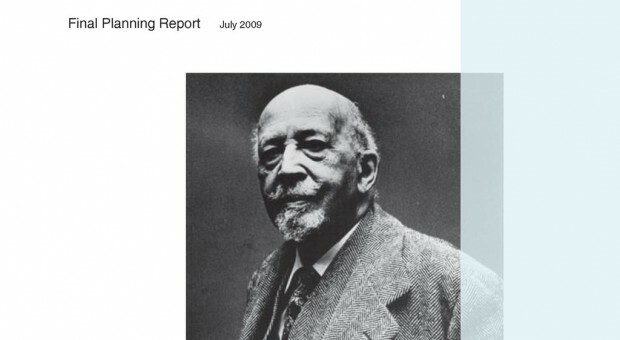 Du Bois at the conference Shaping Role of Place in African American Biography in September 2006. He also presented the report at an open community meeting at the AME Zion Church in Great Barrington as part of a W.E.B. Du Bois birthday celebration in February 2007. These community based presentations spurred excitement and led to the Du Bois Center at UMass and the Friends of W.E.B. Du Bois receiving state and private grants for Michael Singer Studio to produce the report W.E.B. Du Bois Boyhood Homesite and Great Barrington: A Plan for Heritage Conservation and Interpretation. This extensive report provides an overall outline of the multi-faceted project and is being used as a fundraising tool for the Homesite and a W.E.B. Du Bois Center located in Great Barrington. The report includes the physical planning guidelines for multiple sites, critical interpretive content to be covered at the sites, initiatives and programs common to all of the sites, and a budgetary outline and approach to phasing. Numerous scholars and interpretive design professionals contributed to the dialogue at intensive workshops in 2008 and 2009 and assisted in the final editing of the report which was completed in July 2009.